Thunbergia erecta growing herbaceous of the genus Thunbergia also known as Bush clockvine or King’s-mantle, Thunbergia erecta perennial evergreen plant also used as ornamental plant and can be hedge plant, can grow in tropic, subtropical, mediterranean climate and growing in hardiness zone 10+. Leaves color green in elliptic shape the leaves connected in pinnate structure. 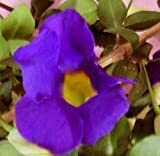 Flower fragrant, color purple or white in tubular saucer shape.